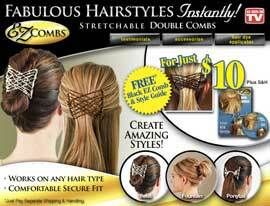 EZ Combs™ is the new hair accessory that stretches to easily create popular hairstyles instantly! It´s great for women of all lifestyles with thin and thick hair. Today as part of this special internet offer, you will receive the amazing new EZ Combs™ in fashionable Caramel Bronze and Dazzling Silver for only $10 plus $6.99 shipping and handling. As a BONUS, you´ll also get our Classic Bermuda Black EZ Combs™ and our helpful Styling DVD that you´ll love, just pay separate $6.99 shipping and handling. This special EZ Combs™ offer for only $10 is not available in stores so the only way to get it is to place your order now!